While we may have not have placed as high as we expected, both the Canoe and Bridge teams worked admirably towards their goals, and while we did not achieve some of these goals, I expect there to be a bright future for both of our teams, especially since next year’s regional competition will be here at SIUC! The Touch of Nature Bridge is now completed, thanks mainly to Alex Kreke and his hardwork and determination! It even withstood the stress of dozens of marathon runners. We held our annual end-of-the-year banquet on May 2, and we recognized members of this ASCE chapter for outstanding achievements and memorable, funny moments throughout the year. -Crawford, Murphy + Tilly, Inc.
We have our sights now on next year, and we’re ready to defend our yard at Conference at SIUC in 2018! Go Salukis! Our regional conference competition will be on April 21-22 at the University of Arkansas. We have two meetings this month. Speaker: Matthew Riechers, alumnus of SIUC. The deposit for Conference ($20) is due. This will be a mandatory meeting for members attending Conference, as we will go over important details on the itinerary, schedule, and more related to Conference. Payment for the conference t-shirts ($12) will also be due at this meeting. Both the Bridge and Canoe are almost complete. As of this writing, the bridge is going through some final welding, and it should be ready for our builders to start practicing with it this week. The finishing touches are being added to the canoe; it should be done later this week. The TON bridge is about 80% done, with the decking support nearly completed. It has been pushed back a week (April 15) due to harsh weather conditions. Visit our events/fundraising page for more information. I hope all you readers have a fantastic Easter, and wish us luck for Conference! Our next (and only) chapter meeting this month will be on March 28. The ASCE will operate the concession stand during the High School Super Sectionals on March 7. Those who volunteered should meet in the Engineering building in wing D (at the hallway by our office/shop) by 3:50 p.m. 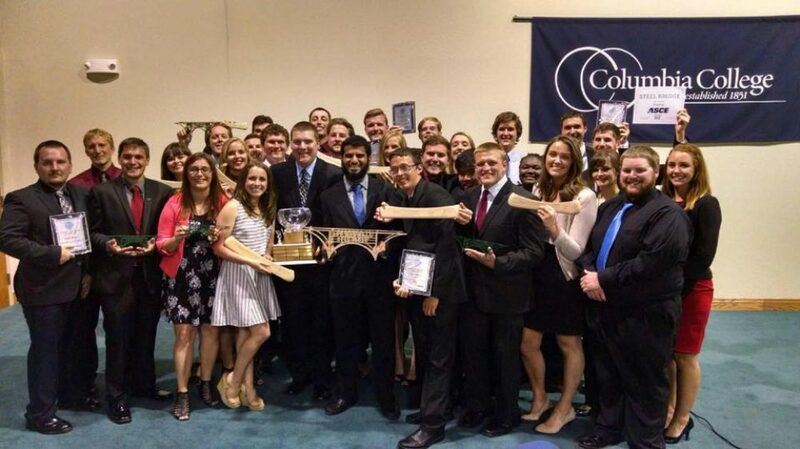 Both the Concrete Canoe and Steel Bridge teams are wrapping up their respective projects for this year’s regional competition on April 21 and 22 at the University of Arkansas. Next year’s regional competition will take place at SIUC! Our ASCE chapter is also hard at work at building the bridge for our Touch of Nature initiative. Congratulations to Fernando Sanchez for winning our ASCE logo contest! Habitat for Humanity will take place on April 8 from 8 A.M. to 12 P.M.
For our list of current fundraisers and social events, go here. I hope you all have a wonderful spring break and an excellent St. Patrick’s Day. Hello members of ASCE! Starting this semester, this website will now have monthly updates on the current and future events happening in the SIUC ASCE Student Chapter! Every update will include future meeting dates (which will all be at 6 P.M. in A131 of the engineering building this semester), fundraisers, news, and other social events in order to keep you posted on all things ASCE. For more information on these fundraisers and other social events, go here. Both the Concrete Canoe and Steel Bridge Teams are preparing for our Conference competition, which will take place at the University of Arkansas on April 21 and 22. For our Touch of Nature Bridge initiative, the ASCE has received $250 to help fund the project. The SIUC ASCE Chapter is getting a new logo this year, and it could be yours. Open now until Valentine’s Day (February 14th), the ASCE is holding a Logo Contest, where the winner will not only have their new logo emblazoned on everything ASCE, but you could also win a free tub of ice cream of your choosing (courtesy of our new Chapter President Daniel Lee). ASCE is participating in Habitat for Humanity this semester in order to help build affordable houses for those in need. The movie Dream Big is playing in St. Louis on February 25 at 5 P.M., and there are 8 seats available to any ASCE members. For more information on social events, go to the link above under the fundraising section. I hope you guys and gals will have an excellent semester here at SIUC and in ASCE!